To knit or not to knit socks. 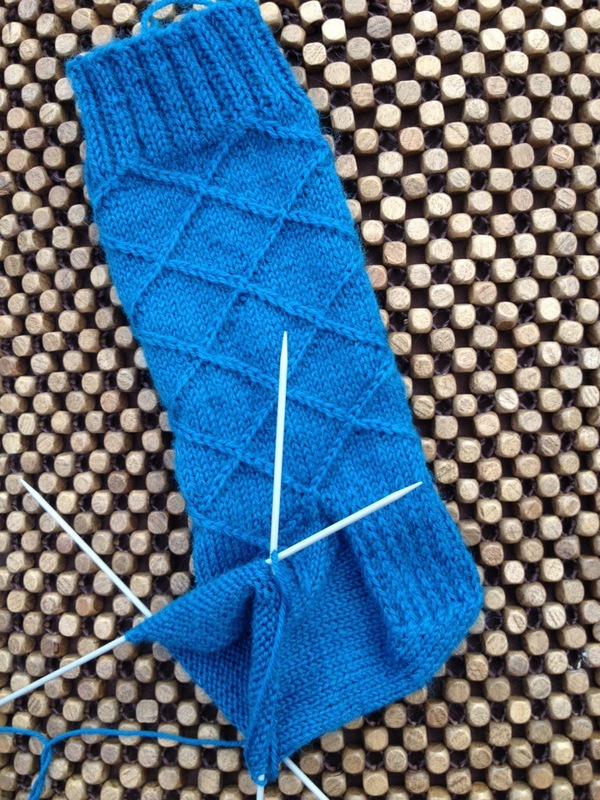 I’ve just read this enjoyable post about sock knitting by Glenna from Ontario from the knitting to stay sane blog. In the post she gives so many hints and tips about how to start, links to starter patterns and ponders why some knitters love to knit socks and others only make it past the first pair before they decide, ‘been there, done that’. I have a different kind of view. I love to see them in my sock drawer. I love this little portable project. However I am kidding myself. I never wear them beyond the first wearing. I never choose them over my rtw cotton, bamboo or even wool ones. OK my early ones are a little large and therefore a little sloppy to wear. And I got only half way through these ones before realising they were too tight. I can completely understand that fitting was not going to be perfect in the early days. My problem comes from finding them all jolly uncomfortable to wear. They seem so harsh beneath my soles. I can feel every loved stitch. I never thought I had sensitive soles!!! I’ve tried so many different yarns but I’ve not yet experienced that ‘once you’ve worn homemade socks you’ll never buy shop bought again’, feeling. I don’t even have a problem wearing any fibre next to my skin. Am I alone? I’m sure others are actually wearing their knitted socks, not just poising in them for their blog posts. Could you recommend me some yarn? Something to encase my feet in clouds? Something obtainable within the UK? Or do I walk away, emptying my sock drawer into the charity bag? Oh, what a shame! I’ve made a few eons ago, and I must admit I only ever wore them a ‘slippers’ or bed socks. I found them far too thick to wear with any kind of boots too. Mine just feel down right dangerous to wear in the house by themselves. I would probably slip right down the stairs! I just stopped myself from liking your comment! Clearly not a good thing… Bed socks then? Mmmmm. Me too. I can’t be only one who experiences this. The one and only pair I’ve made are winging their way to my daughter, so I can’t comment on wearing, but I’m not rushing to make the next. Definitely feeling they were interesting to make, but do I really want to wear hand knitted socks? The only appeal is that they fit in your handbag, but so do other projects – especially gloves/mittens which I and the girls are always losing. I look forward to hearing what others say too. I thought wearing my hand knitted socks would make me feel virtuous. Like Barbara Good off the Good Life! I really enjoyed using a german yarn ‘Opal’. It knits up beautifully, is not too thick and the one I used gave a really good fair isle effect. I have worn them in the winter with boots and with trainers for Zumba class but, mostly, I wear them for the beginning and end of my yoga class. You can find some examples here http://www.loveknitting.com/opal-knitting-yarn? Can you feel the stitches beneath your feet as you walk? I can’t forget that I’m wearing mine. Merino! Merino is definitely the way to go. Lovely and soft. I used just an ordinary merino dk and the free Violet Green dk pattern generator (think she only has the 4 ply generator on her site at the mo). It’s plain, but you could superimpose your own patterning on it! 100g made one pair about mid calf length. Have worn the 3 pairs I did with boots, crocs and trainers – more of a winter sock, but am planning to make a shorter version in 4 ply for warmer weather at some point. Love that Violet Green link. Thanks for that. I don’t mind the price if I actually produce a pair I love wearing. Thank you for your comment. Do they pil? How do they last? Great blog, btw! Only discovered it recently and think I have now read every single post! If I can knit a pair I love wearing, the price is entirely appropriate. Thanks for your suggestion. I’m making a list! I’ve only ever knitted one pair of socks and like you I could feel every stitch under my feet as I wore them. I think I wore them once, that was it. I have been rather disappointed in how little I like them! I will look out for it at Yarndale this year. I find the same with shoes! I embarrass my daughter by how long I spend walking up and down a shop making sure I can live with a new pair. I’ve never made them, but always fancied having a go. I’ve been put off my the length of time to make something which might not get worn very often. I think I’ll stay clear until you can recommend some comfy wool and a pattern to go with it! Good luck! So many others love their socks. I just want to love mine too! I will try with one more pair, but not until the summer(???) is over. I’m the same way — my one pair of knitted socks is too uncomfortable and I never wear them. They were in a worsted weight yarn though, so maybe a thinner yarn would feel better? Crocheted socks are a no-go, too, even in sock weight yarns they hurt. I always thought that about crocheted socks too! Everything I’ve tried just seem so harsh. I’ve been given lots of good suggestions though. Let us know which of those suggestions are the best if you try them — I’d like to know what you think! My first pair were for exactly that – to prove I can use dpns! But then I had to perfect the fit, and then try a different yarn …..but I still don’t wear any of them! I have knitted more than 20 pairs of socks, and like you, don’t like to feel the stitches underneath my feet. I use 2.25mm needles to get a tight gauge and sometimes, I knit the soles in reverse stocking stitch, so I have the smooth side next to my skin. Try wearing a pair of yours inside out to see whether this would make a difference for you. Good luck. Brilliant idea! I shall have a go and see if it makes a difference for a future pair. maybe with some of the larger ones you could get some slipper sock grips (no idea where) and wear them as slipper socks? I find them incredibly warm too which means i’m always anxious to get them off! I my just have to admit defeat. Wish I could help..I have a Cragtsy Sock class awaiting to be utilised. I do like your bright socks though. Maybe keep as ornamental socks….. I like to see them in my drawer, but that is where my love stops! I can’t knit but my mum knits lots of socks, I’m pretty sure she gets a lot of wool from the lovely wool shop in Clapham, if ever you’re in that end of the dales. 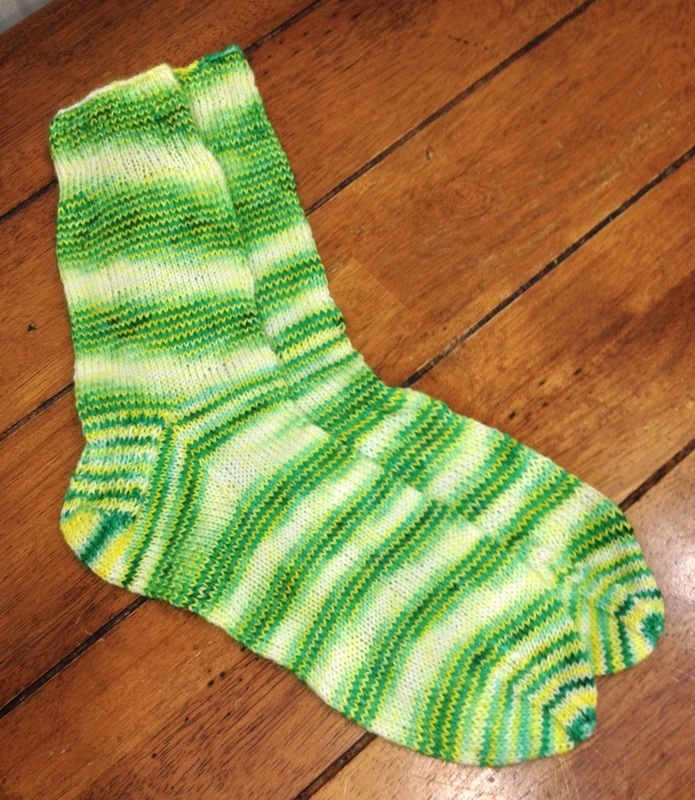 Did you ever find a sock yarn that doesn’t hurt your feet? I have the same problem- love to knit socks but can’t wear them in my shoes. I have been trying all sorts of patterns and yarns, but nothing seems to help. I did have a little success with a princess sole, but purling the entire sole leaves huge ladders on the sides. My next idea is to go for a sport weight yarn in the really expensive stuff. Once I find what works I will buy every colorway!!! Please come back and let me know when you’ve found one. I’m loath to spend the time on more socks but would in a flash if I found the correct yarn!!! I can’t even bare to wear mine barefoot. We can’t be the only ones out there!